All IR studies and procedures, however, have an important thing in common: They use either non-surgical or minimally invasive approaches as an alternative to open surgical procedures. IR typically relies on small incisions, which means minimal pain and a faster recovery for you. 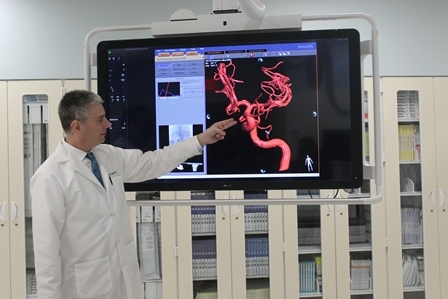 Good Samaritan Hospital, a member of the Westchester Medical Center Health Network (WMCHealth), uses a new 3D imaging platform, enabling a major step forward in image-guided therapy. 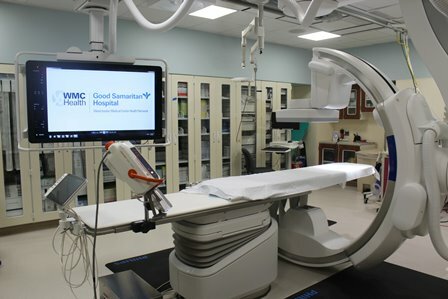 Good Samaritan Hospital is the only hospital in the region with this game-changing equipment. “This new platform allows doctors the ability to accomplish the procedures more quickly and efficiently, which benefits the patient,” said Scott Luchs, MD, Director of Radiology at Good Samaritan Hospital, a member of the Westchester Medical Center Health Network. “It offers physicians optimized imaging visualization, convenience and the ability to provide superior care.” The imaging technology evaluates every artery and vein to identify blockages more precisely, allowing physicians to clear the blockages and remove plaque. * This new equipment benefits patients because it utilizes the lowest dose x-ray possible, thereby leading to better outcomes. “This state-of-the-art equipment and cutting-edge technology ensures that our patients will receive the highest level of care close to home,” said Mary Leahy, MD, CEO of Bon Secours Charity Health System, a member of the Westchester Medical Center Health Network (WMCHealth). Open Monday thru Friday, 8 a.m. to 5 p.m.